Mitchum Triple Odor Defense technology. Provides a shield against odour from heat, motion and stress. Expertly formulated for ultra-powerful 48 hour sweat + odor control. Goes on invisible, leaving no white residue on skin. Dermatologist tested. Alcohol free. 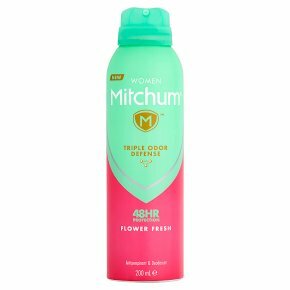 Mitchum Women Flower Fresh Triple Odor Defense 48HR Protection Anti-Perspirant & Deodorant Aerosol 200ml, expertly formulated for ultra-powerful 48 hour sweat + odor control, so you can feel your most confident. Now introducing, Mitchum Triple Odor Defense Technology, a shield against odor from heat, motion and stress. SOLVENT ABUSE CAN KILL INSTANTLY<br><br>EXTREMELY FLAMMABLE AEROSOL<br><br>DANGER: PRESSURISED CONTAINER: MAY BURST IF HEATED. PROTECT FROM SUNLIGHT. DO NOT EXPOSE TO TEMPERATURES EXCEEDING 50 °C/122 °F. DO NOT PIERCE OR BURN, EVEN AFTER USE. DO NOT SPRAY ON AN OPEN FLAME OR OTHER IGNITION SOURCE. KEEP AWAY FROM HEAT, HOT SURFACES, SPARKS, OPEN FLAMES AND OTHER IGNITION SOURCES. NO SMOKING. KEEP OUT OF REACH OF CHILDREN. FOR EXTERNAL USE ONLY. DO NO APPLY TO IRRITATED OR DAMAGED SKIN. STOP USE IF RASH OR IRRITATION OCCURS. AVOID SPRAYING IN EYES. AVOID INHALATION. USE ONLY AS DIRECTED. INTENTIONAL MISUSE BY DELIBERATELY CONCENTRATING AND INHALING THE CONTENTS CAN BE HARMFUL OR FATAL. AVOID PROLONGED SPRAYING.